For the past month, it has been really hard to go on Facebook without running into a ‘Bird Box’ meme; you know, the image of Sandra Bullock wearing a blindfold while rowing a boat with two kids inside it? I have honestly never seen a movie as talked about/hyped up since Disney’s ‘Frozen’ back in 2013, let alone one from Netflix. I have heard of shows like ’13 Reasons Why’ and ‘Orange is the New Black’ going viral, but as far as Netflix original movies go, they are rarely discussed. I am glad that the hype train has given me the opportunity to check it out myself. From what I can tell you, ‘Bird Box’ is actually good, though I do not get the hype. 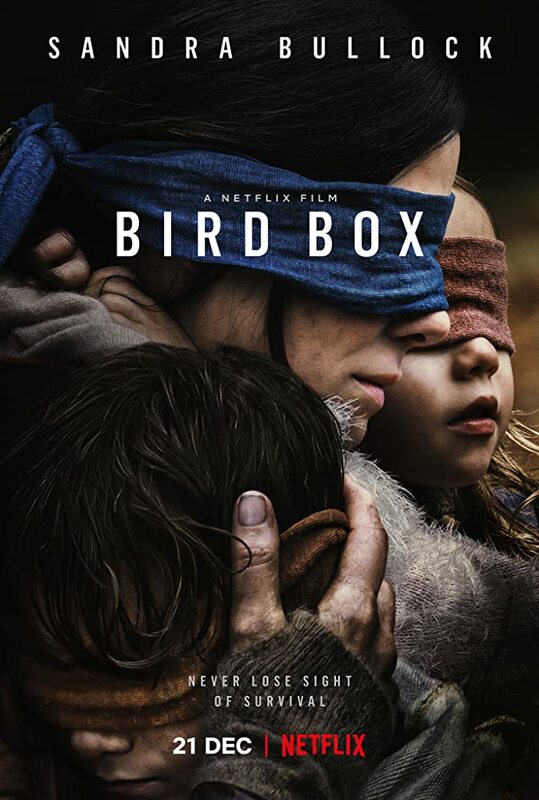 In ‘Bird Box’, Bullock plays a woman named Malorie Hayes, who sets out on a boat with her two children (which explains the famous meme) after mysterious creatures causes an outbreak of mass suicides from those who take one look. In terms of survival and post-apocalyptic paranoia, ‘Bird Box’ has been compared to both ‘A Quiet Place’ and ‘The Happening’, yet before those movies were released, ‘Bird Box’ got its start as a best-selling novel by author Josh Malerman; though I have never read the book, I believe that it seems intriguing. Also, what separates ‘Bird Box’ from those two movies is how it switches back and forth between past and present. As we see Malorie’s journey to find a safe haven, we get a glimpse at the aftermath of these suicides, and her joining other survivors. The survivors she meets are Tom (‘Moonlight’s Trevante Rhodes), a war veteran who takes a liking to her, Douglas (John Malkovich), the jerk who has his reasons for staying safe, Cheryl (Jacki Weaver), the motherly figure, Olympia (Danielle McDonald), a military wife who, like Malorie, is pregnant, which creates a bond between them, Charlie (Lil Rel Howery), a grocery store clerk who serves as a bit of a comic relief, and two survivors named Lucy (Rosa Salazar), and Felix (Machine Gun Kelly of all people), who really have not much character to them, other than being the two characters you want to see together. If you really think about it, ‘Bird Box’ is nothing new in the post-apocalyptic survival genre, but with excellent performances, a chilling score, and tension, it manages to become one of the scariest movies to ever exist. That may be an overstatement, but I will say that it fits more in line with ‘A Quiet Place’, and makes you want to forget ‘The Happening’, even if you cannot see the horror. Such an overhyped movie. It was competent and did what it set out to do just fine, but not nearly as much as the hype is making it out to be. It would have been nice to have ever gotten any kind of explanation as to what the creatures were. I know that wasn’t the point of the movie but ultimately it ends and I’m just left feeling like the whole thing is incomplete because really we know nothing more than when we started and while they have gotten to a new safe haven, who knows how long it is safe for. Good point. I wished I had gotten to know more about the creatures myself.